Goldfish have been kept in captivity for centuries. A fish with a reputation for eating algae might seem like a great companion for a goldfish. After all, such a fish could help clean the tank off algae. However, the Chinese algae eater is a poor companion for a goldfish for a number of reasons. The Chinese algae eater (Gyrinocheilus spp) also sells under the name Indian algae eater. However, the fish originates in Thailand and neighboring countries, not China or India. These fish are slender and torpedo-shaped. They have a pattern of dark stripes on a brown or beige body. The fish grows up to eight inches long, though most pet shops sell them when they are smaller. Their body shape is adapted for life on the bottoms of rivers. Goldfish (Carassius auratus auratus) differ in may ways from the Chinese algae eater. Goldfish have bodies adapted for swimming throughout the water column, rather than living on the bottom. Different breeds or varieties of goldfish come in a dizzying array of coloration, size and even body shape thanks to generations of selective breeding. Depending on the individual fish and its care, a goldfish can range in size from a few inches to more than a foot in length. Goldfish and Chinese algae eaters belong in different tanks due to their respective temperature requirements. Goldfish originate in temperate climates. This means they do their best at temperature up to 70 degrees Fahrenheit. The Chinese algae eater comes from further south in the tropics. It tends to thrive between 72 to 78 degrees Fahrenheit. While there's some overlap between the high end of goldfish and the low end of Chinese algae eaters' temperature range, it's either hot for goldfish or cold for the algae eaters. This can lead to stress and disease for the fish. Additionally, Chinese algae eaters' temperament and changing diet can make them a poor match for goldfish. When they're young, Chinese algae eaters tend to eat algae. But as they grow, their diets change. And as adults, they will also feed off the body slime of other fish, like goldfish. Since a fish's body slime helps protect it from infection, this can be a serious problem for the goldfish. 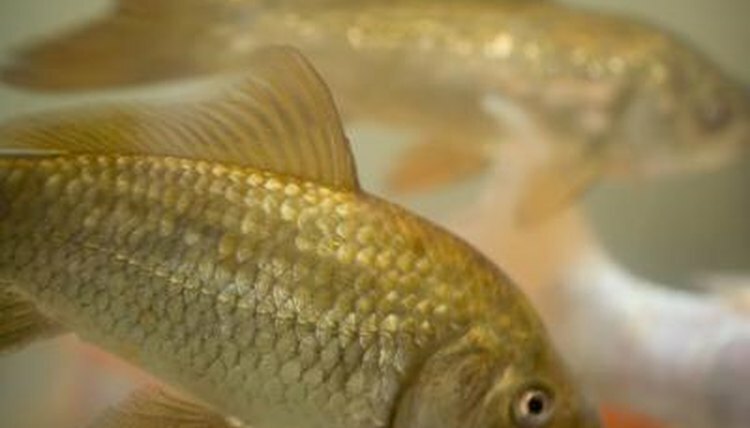 As they age, Chinese algae eaters also become aggressive and may fight goldfish.